Good camps, bad camps. What’s wrong with the ‘Jungle’? The ‘Jungle’ has come to symbolise the negative mirror image of a refugee camp, its ‘Other’ in which power and civilisation are twisted and virtually turned upside down. Calais Jungle, January 2016. Flickr/MalachyBrowne. Some rights reserved.It was an undignified sight. On March 1 this year, hundreds of French police officers in riot gear and private contractors in orange vests streamed into the irregular refugee settlement outside Calais, also known as the “Jungle”, to demolish large numbers of makeshift housing structures and evict hundreds of inhabitants. At the end of the day, smoke rose from the camp as some shelters accidently caught fire from the heat of tear gas canisters fired by the police, while others were set ablaze by refugees themselves as an act of defiance against the authorities’ intrusion. But this premeditated demolition, which began after the prefecture of Calais had finally won a court battle on whether the unauthorised settlement was to be removed or not, is just the latest episode in an ongoing struggle of refugees, asylum-seekers, and other migrants for human dignity, safety, opportunity, and the right to choose their preferred place of residency – for many in Calais, that place is the United Kingdom. Since 2002, several unapproved camps have sprouted near the port of Calais and time and again have been closed down, ‘evacuated’, and removed. Each time, the expelled residents regrouped and reorganised by building the next camp, the newest of which is located on an old landfill site. For many of the camp’s residents, facing the recurrent threat of forcible removals, and bearing the ensuing displacement from their provisional homes, brings back memories of those countries of origin from which they originally escaped under the duress of conflict, oppression, or economic precariousness. On a macro scale, the orchestrated and officially-sanctioned destruction of the Calais camp in the past few weeks has again confirmed a long-held premonition: there are two kinds of refugee camps - “good camps” and “bad camps”. Good camps are those settlements in which refugees are being managed, spatially organised, categorised, and where they receive assistance under the oversight of international NGOs, the UN Refugee Agency (UNHCR), and host governments. These institutionalised camps on Europe’s doorstep are a way of keeping marginalised and displaced populations quite literally ‘in their place’. The French anthropologist Michel Agier has poignantly referred to this as the global governmental technique of “managing the undesirables”. At the same time, the British government under David Cameron refuses to grant refugees adequate protection by barring them from entering the UK asylum system and reducing legal channels for immigration. According to the British Refugee Council, the UK government rejected 61% of asylum applications and granted refugee status to only 2,381 individuals in the last quarter of 2015. Instead, the UK government champions rather dubious plans to support Syria’s neighbouring countries in sustaining growing numbers of refugees in humanitarian encampment. Yet, countries like Jordan, Turkey, and Lebanon are already struggling to deal with immense numbers of Syrian refugees. A much-quoted statistic says that every fourth person in Lebanon is now a refugee. Not to mention that African countries like Ethiopia, Kenya, Uganda, and Tanzania have hosted hundreds of thousands of displaced people in refugee camps for decades. It is therefore true that regional governments need more assistance to cope with the financial and logistical constraints that the refugee influx has placed on the national infrastructure and state budgets. However, Europe’s current ‘hands-off’ policy, which promotes the proliferation of refugee encampment ‘over there’ while seeking to outsource its international legal obligations, is not just undesirable, but also shameful. The EU’s recent deal with Turkey on the return of refugees from Greece is a disastrous example. The British scholar Mark Duffield rightfully debunked these manoeuvres as neoliberal strategies of western governments to control the “global borderlands” (2001). 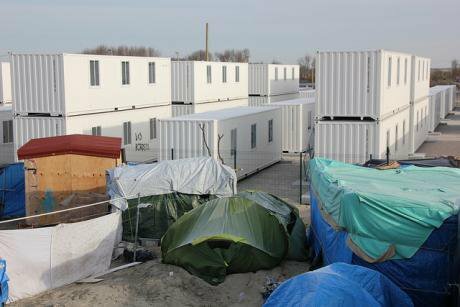 Unwanted populations are contained and immobilised far away from European metropolitan societies, but are kept in-check by an institutionalised landscape of camps. It is these “good” top-down refugee camps that restrict the free movement of those who are confined to them and garner praise from politicians and national governments for making greater mobility and human rights a distant mirage. In official UN speak, this same logic resurfaces in the concept of increased “resilience”. In response to the Syria crisis, the United National Development Program (UNDP) proposed a Regional Refugee and Resilience Plan (3RP) that “effectively harnesses the capacities, knowledge, and resources of humanitarian and development partners to create a durable and multi-faceted resilience-based response to the Syria crisis.” In other words, it discourages people from migrating to neighbouring countries and, eventually, to Europe. Under the guise of an innovative strategy to tackle the Syrian crisis, the 3RP programme promises to invest billions of dollars in community resilience schemes in Syria and regional partner countries like Turkey, Jordan, Lebanon, Egypt, and Iraq. In its Strategic Overview (2016-2017), the UNDP stipulates that “after large investments in establishing camp infrastructure in Jordan and Iraq in recent years, the Shelter Sector is appealing for a reduced amount in 2016 as it moves towards a maintenance phase in camps” (UNDP 2016, 7). It is indisputable that vast numbers of people depend on immediate humanitarian assistance like food provisions and shelter, even in volatile areas where access is limited and dangerous. But, to suggest that such resilience programmes in the region aim at more than erecting a thinly-veiled humanitarian buffer zone is to ignore the devastating repercussions mass immobilisation might entail. Promoting encampment as a ready solution for displacement is at best ‘tilting against windmills’. The UNDP’s 3RP programme relies on a network of “good” refugee camps on Europe’s outer fringes, whereas irregular settlements like the Calais or Dunkirk ‘Jungles’ in the heart of the continent are commonly discarded as the “wrong” kind of camps. While good camps are seen as disciplined spaces where a benevolent humanitarian regime is at home, the semiotics of the ‘Jungle’ convey a contrary message. A recent article in The Independent argued that “the Jungle is not a refugee camp. It is a camp full of refugees and the distinction is important”. Europe’s most notorious “bad” camps in Calais and Idomeni are places that seem to defy the neat ordering mechanisms normally put in place by the powerful. Here, a policy of containment remains unsuccessful, because everyday actions of ordinary people - refugees or not – can throw a wrench in the works of inhumane institutions. Their unique mix of refugees, asylum-seekers, and undocumented migrants are thus branded as troublesome and insubordinate. In usual Orientalist fashion, the ‘Jungle’ has come to symbolise the negative mirror image of a refugee camp, its ‘Other’ in which power and civilisation are twisted and virtually turned upside down. Far from romanticising the harsh and squalid conditions on the outskirts of Calais or in Greece’s Idomeni camp, and considering the incidents of (sexual) violence and victimisation which many residents have experienced, these camps’ existence is paradoxically both a human tragedy and a sign for unabated resistance to injustice. This fateful double-meaning of the ‘Jungle’ best exemplifies the moral bankruptcy of Europe’s refugee and migration policies. The “good” and “bad” camps of our time remind us that this must change.